Want to give your entire Ellicott City home a facelift? Having new vinyl siding installed is a perfect way to do just that. Roland Slate Service offers a variety of styles and colors to choose from, so you can create the look that you’ve always wanted. Plus, it will be installed by our own team of highly skilled technicians, to help ensure lasting performance. And, for the ultimate peace of mind in your investment, your new vinyl siding will be backed by a lifetime warranty form the manufacturer along with a one-year labor warranty. You will be hard-pressed to find that level of protection from any of our local competitors. 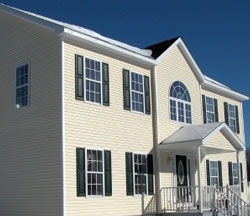 To learn more about the vinyl siding that we offer, contact Roland Slate Service today. We proudly serve homeowners in Ellicott City and nearby areas.